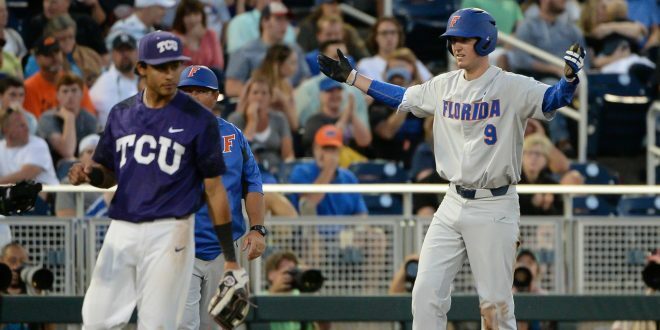 The Gator baseball team, and more specifically Alex Faedo, handed Texas Christian University a shutout already this College World Series but one time wasn’t enough. 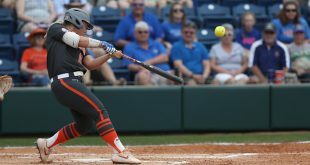 In the rematch game on Saturday, the Gators were victorious over the Horned Frogs 3-0, earning a spot in the College World Series finals. 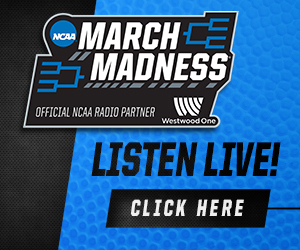 Heading into the game, Florida head coach Kevin O’Sullivan said that if his team is going into battle with the season is on the line, Alex Faedo is his guy. Boy, was he right. 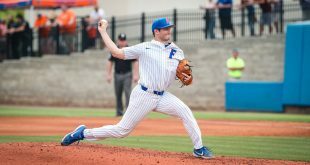 Not only has the junior right-handed pitcher risen to the occasion in the Gators’ post season but he has dominated in both of his College World Series performances this year. 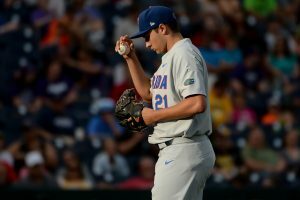 In the Gators opening game against TCU, Faedo started and carried the team through seven innings, recording 11 strikeouts. On Saturday he replicated that authority over the Horned Frogs, securing the win to birth the Gators to the championship series. He finished with a final line of 7.1 innings pitched, three hits, zero runs with four walks and 11 strikeouts. Not only is his stat line impeccable, but he also set records during the outing. Faedo now holds Florida’s single-season strikeout record and currently leads college baseball in strikeouts with 157. 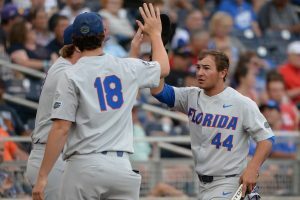 The Gators have struggled offensively all season, and with Faedo holding it down on the mound, they were able to muster enough offensively to top TCU. They got on the board after Austin Langworthy gave them a good start in the second inning with a double down the line. Jonathan India hit a bloop to left field, putting runners on the corners. Mike Rivera lived up to his trending nickname of “RBIvera” knocking Langworthy in with a grounder. Uncertainty fell on the Gators early in the game though, when shortstop Dalton Guthrie suffered a lower back injury. 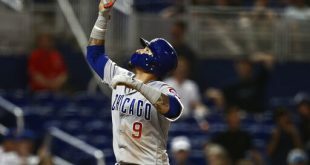 Guthrie seemed to injure himself during his first at bat but played through the pain until his second plate appearance in the third inning with he went down swinging and entered the dugout with tears of pain and frustration as he would not enter back into the game. Blake Reese came in to play second and Deacon Liput shifted over to the other middle infield position to fill in for Guthrie; his status for the championship series remains uncertain. RBI. The double helped to put the Gators ahead 2-0 in the fifth inning, scoring Rivera from first. Liput brought Hicks home in the seventh inning after his three-bagger to give the Gators a 3-0 lead. 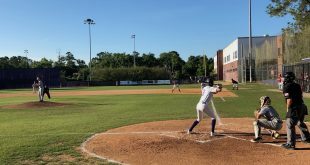 The Horned Frogs started Jared Janczak who pitched well, tossing seven innings and giving up three runs on seven hits. He didn’t walk a batter and fanned seven and pitched in some tough luck too. On Liput’s RBI single, it appeared the hit was going to be a routine ground out to first but the ball bounced off the bag and ricocheted into the infield for TCU second baseman Cam Warner to field it. It was too late; Liput beat the throw and Hicks safely made his way home. Michael Byrne relieved Faedo in the eighth inning and picked up his school record 18th save of the season. And with the win, Florida has a chance to win its first national title but it will have to get by SEC foe LSU in the finals that begin on Monday. 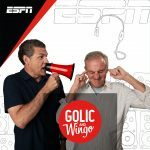 Florida (50-19) will play Southeastern Conference rival LSU in the best-of-three finals beginning Monday night for the national championship. Fourth-seeded LSU (52-18) advanced with a 6-1 win over No. 1 Oregon State on Saturday. The Gators swept the Tigers in their regular season series in Gainesville. The two teams were co-regular season champions but LSU won the SEC tournament. The all-SEC championship series will be the ultimate showdown between the two rivals. The series will kick off Monday at 6 p.m. with Tuesday’s game set for 7 p.m. and Wednesday (if necessary) at 7 p.m.